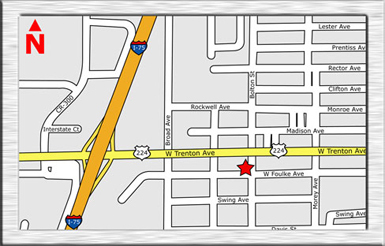 Haley's Machine & Welding is located on Foulke Avenue a half block south of Trenton Avenue. From I-75, exit on Route 224 (Exit 159) and head East. After a half-mile, turn right on Bolton. We're a half block down the street on your right. We're open Monday-Friday from 9:30-6:00, and close for lunch over the noon hour.